The four city dream as we can still refer to it after over a month of it being over, still haunts many of my nights. The gut wrenching feeling of still wanting to be there (somewhere) makes me blush at times and at other times makes me sad that this holiday is over! First of my four part series(that I hopefully will be able to complete) is about the four days we spent in Rome. First off, the Etihad flight we took from India to Rome with a stopover in Abu Dhabi was quite bad, mainly to do with really narrow seats and the too cold in-flight temperature. Anyway having gotten that over with, upon reaching Rome airport, we saw that there is no word synonymous with ‘queue’ in Italian? The way to immigration desks was way too crowded, with people shoving at others, yelling and blatantly taking shortcuts to the desks. Since we arrived morning, we did not get the room right then. Our room was near Termini station and that is the best place to stay! Leaving the luggage at the hotel, we made our way Spanish steps first, at Piazza Spagna. Piazza I suppose is the word for a square in Italian, which is generally surrounded by important places or tourist attractions. The steps were a nice way to get a first feel of the city with it overlooking many luxury brand houses with horse drawn carriages at their doors and a small fountain in the center of the square. Walking along from there, we then arrived at Trevi fountain. I had wished I would come here and toss a coin and that would bring me back to Rome again! Thats true.. when hubby went there earlier, he had tossed a coin and it took him back there. Yes, I am a believer! 🙂 Now I dont know if I can ever go back to Rome as the fountain was under renovation … making sad faces like a baby and sulking for a while, I thought, well if this is indeed true and I can never go back to Rome, I have to make the best of it now, right? Yeah, on our way to the Pantheon, walking along narrow lanes, we had the best Pizza I have ever had in my whole entire life.. thats true.. it was a 4 euro slice that two of us couldn’t finish and it was dripping with very flavourful olive oil and cheese that I have never had before. Its true.. you must try it. Walk from Trevi to Pantheon and just eat Pizza along the way. It was a cloudy evening and my personal guide with prior travel experience here knew that it would be best to spend this weather at castle Sant’ Angelo. The bridge that leads up to the castle overlooking the river makes for a perfect evening walk. The museum however close by 5 I guess, so we missed that. But no harm, we walked over to a nearby park and ate mouth watering Gelatos, sitting on a bench and watching locals go by and shopping at a flea in the park. Colosseum being the most famous tourist attraction in Rome, I thought it might be a little over hyped, you know, like some are! When everyone talks about how great a movie was or how yummy some food was(I hope the pizza mentioned above lives up for you :P), it falls flat. But MAGNIFICENCE! It was huge.. you cannot see both ends in 2D of the Colosseum without moving your head unless you are viewing it from the top of Roman Forum (which you should really do because the view from there is the best). 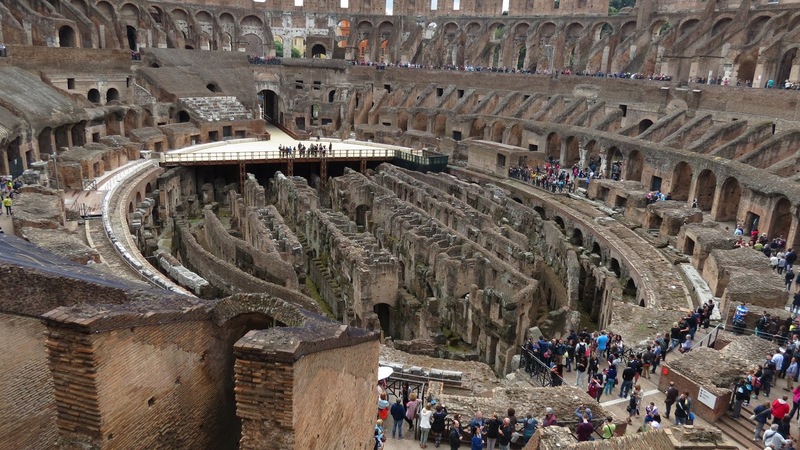 There is also an underground tour of the colosseum for which tickets were sold out, that is to see where gladiators and animals were caged before battle. This reminded me of the battle scenes in front of Khaleesi in Game of Thrones. 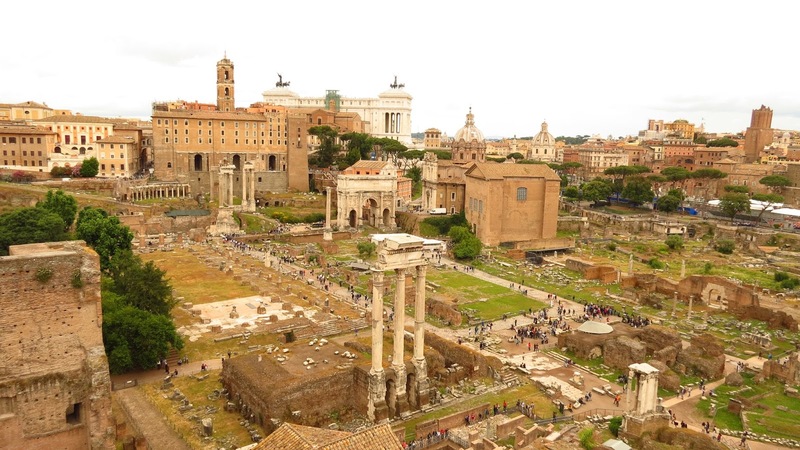 Roman forum which is right next to colosseum feels like taking a tour back in time. This was the epicenter of its ruling with ruins of temples, statues, fountains, residences of kings and priests. A few hours spent here made me want to study history all over again from school text books. It made me realize how much modern day development has been inspired really from the past and also that I have forgotten history. I had seen postcard images of external walls of the colosseum and heard of how beautiful the Vatican city was. But being there in person and witnessing a celebration of art in an era gone by, gave me goosebumps. The colours used, the difficulty of painting a fresco on the arched roofs and nailing it. Wonder how they made the colours so vivid in those days! Most of the paintings in the Vatican museum were depictions from the bible. It tells how much mythology there is and how deep the bible and Christianity is. But what really consumed me was how in many paintings there are numerous characters, often times animals, a context being set, complete with elements of nature as well, but each individual character, each leaf of a tree, each flick of a tail of an animal is beautifully painted without any photographic images serving as a reference. That is commendable! Salute the artists and their attention to detail. The paintings with fight scenes, hatred, bloodshed are also beautifully done and draw one’s attention without being repulsive. The expressions of one’s face is conveyed through the character’s eyes, the frown, with hand movements and so on. Inspired me to come back home and read up on all that I had seen. What I did not mention earlier was a funny thing. Vatican city being a country in itself, how would one generally go to a different country? By plane right? Fine, given that its the smallest country, may be a short bus ride? No! 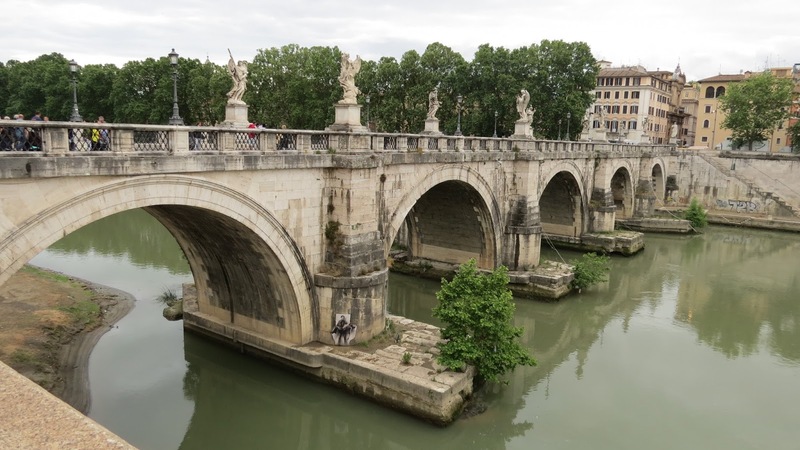 Its a very short walk from castle Sant Angelo. One second you are in Rome and you cross a road, not a highway kind of a road, just a regular road, and you are in Vatican. I was thrilled like a baby in a candy store.. may be my ignorance! But well, that was the plan, to not do any research as that was taken care of by my personal guide and I wanted to be thrilled and surprised by everything I saw. 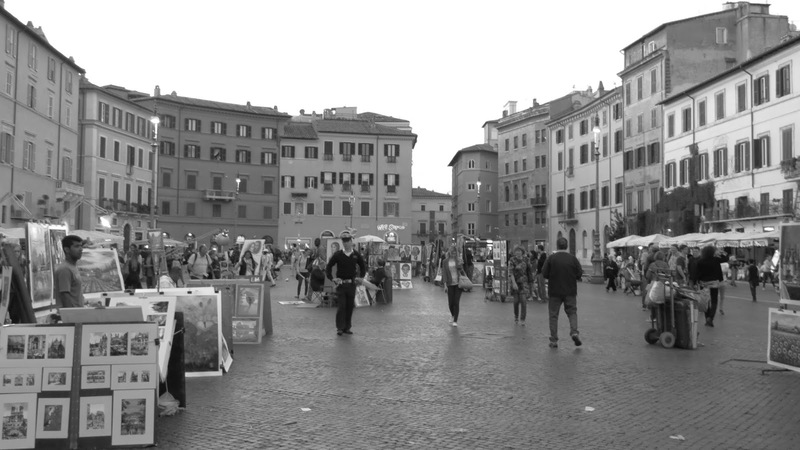 Piazza Navona is another place worth totally spending an entire evening in. 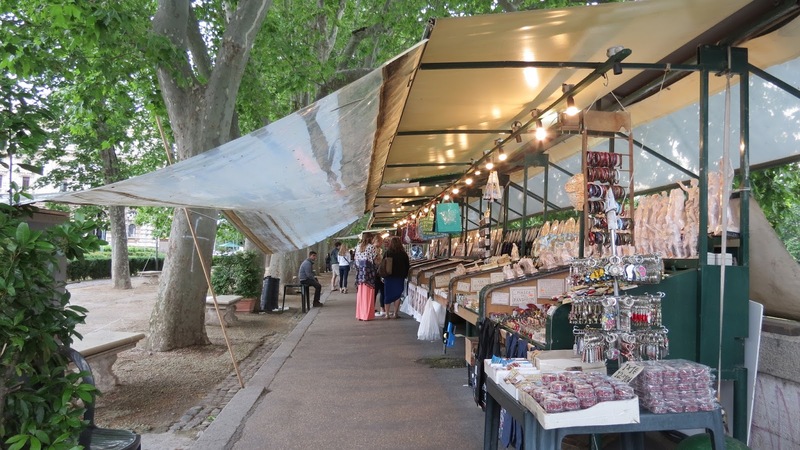 It is a huge public place with fountains and benches with buildings around and evenings come alive with street performers and artists putting up paintings for sale and there is music and the like. Just be in the moment and walk around and take pictures. 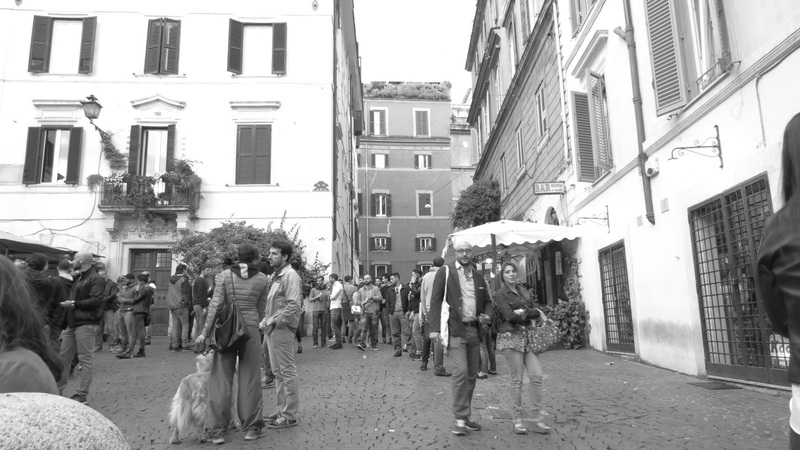 You know how in Woody Allen movies, people are in a European street having random conversations for which there is no subtitles sometimes and there is a cello or violin playing in the background and they keep eating.. well Rome is just like that. Just keep walking and please get lost in its alleyways, cause its when you get lost is when you discover charming streets and fountains. And go to Cavour. Get off the metro in Cavour, just keep walking and you will find a church, a random street where people are buying beer and drinking and there are restaurants and vintage shops. Well, I can totally still feel it, had a very easy vibe. 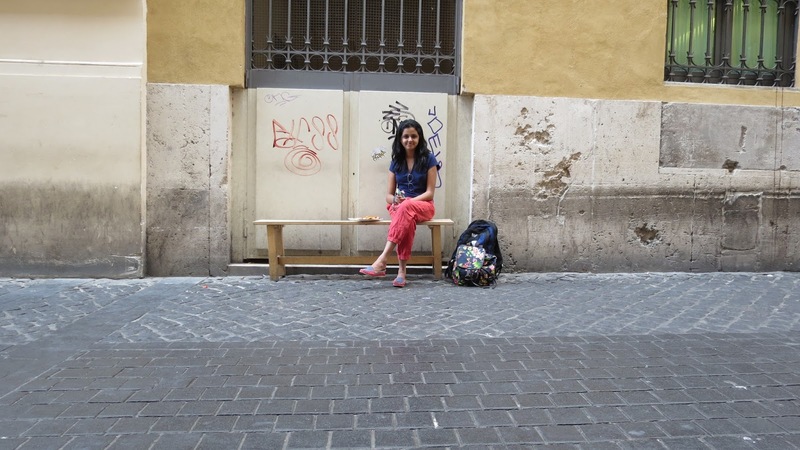 Rome was my introduction to Europe, It was love at first sight for me and each experience made my love grow deeper.There are these tiny streets which make for perfect photo shoot locations, it is a historical city with small town feel and at the same time feels very modern. It has as much of a local easy vibe as it does touristy. It swept me off my feet.. I hope it does you as good as it it did to me. Here are some of my tips for you: Thanks to offline maps, we could do a lot. We used Here maps and Ulmon. Termini has a bus stop too, you could use buses to travel within the city as thats the easiest than finding a train station everywhere. As I said before, walk, your map will guide you back if you get lost.